This post was originally published in Chapter 10 of Reharmonization Techniques by Randy Felts. Include the root of the chord in the voicing (assuming solo piano with no bass player). Include the basic chord sound. For 7th chords, the basic chord sound consists of chord tones 1, 3, and 7. For 6th chords, the basic chord sound consists of chord tones 1, 3, and 6. The 3rd determines whether the chord is of major or minor quality and the 7th (or 6th) determines the chord function. The flat 7th gives the chord a dominant function, while a major 7th yields a tonic or subdominant function. Chord tone 5 is not considered part of the basic chord sound unless it has been raised or lowered (altered), or is part of a triad. Altered 5ths are always considered part of the basic chord sound. Following voice leading principles will improve the sound of a progression. Voice leading connects notes smoothly from chord to chord with a blended, textural sound. It also makes the voicings easier to play on a keyboard. Traditional voice leading focuses on the resolution of tendency tones and avoidance of such intervals as parallel 5ths, octaves, and certain doublings of pitches within chords. Following voice leading rules will lend a recognizable stylistic sound and chord texture. 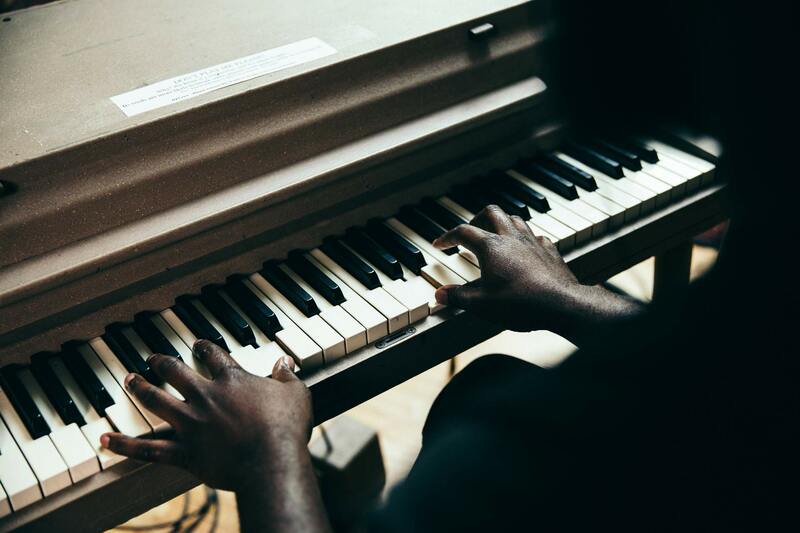 Current jazz and pop composers are less concerned with traditional voice leading rules, but still strive for balanced note spacing and reasonably smooth connection from one chord to the next. The following guidelines will help you create voice leading that is consistent with jazz/pop voicing practices. 1. Determine the basic chord sound for each chord. 2. If the root motion moves by perfect 4th or perfect 5th, resolve chord tone 3 in the first chord to chord tone 7 of the second, and chord tone 7 in the first chord to 3 in the second, as shown in the following examples. These resolutions produce a clear harmonic texture and minimize finger movement from chord to chord. Optional: Change the octave position of the root while other parts move in parallel motion. For example, see the movement of E–7 to FMaj7 between the second and third measures below. 4. If roots move by roots move by 3rd or 6th, use either parallel or contrary motion between the roots and the upper voices. Contrary motion means that voices move in opposite directions: the bass note moves down, while all other voices move up. 5. If the basic chord sound appears to be heading out of range as the progression is voice-led, change the inversion of chord tones within the duration of a single chord and then continue voice leading normally into the next chord. Note that the roots of the chords are not included in the inversion shifts. It is common for jazz-style piano voicings to contain additional tensions along with the basic chord tones. The following example shows available tensions placed above the basic chord sound. G# on F#–7(9) and G# on B7(13) are available as tensions on these individual chords, though they are not diatonic to the key, C major. Be sure to include nondiatonic tensions in the chord symbol. Labeling for available tensions that are diatonic to the key is not necessary. In the following examples, only nondiatonic tensions are indicated in the chord symbols, even though diatonic tensions are also being used. The last example shows an additional tension placed a whole or a half step below the basic chord sound. It is generally good practice to keep all tensions above the F found on the fourth line of the bass clef in order to avoid a muddy sound. Inverted chord structures should include all chord tones and use no more than one octave between adjacent voices. The only exception is the distance between the lowest two voices. If you are striving for a traditional texture, do not double the bass note when it is the 3rd or the 7th of the chord. In the following examples, the “x” indicates chord voicings that would be inappropriate in a traditional context. The checkmark indicates chord voicings that would work well.